Lucite Purse in Unusual Diamond Shape. 1950s. Maker: Wilardy. 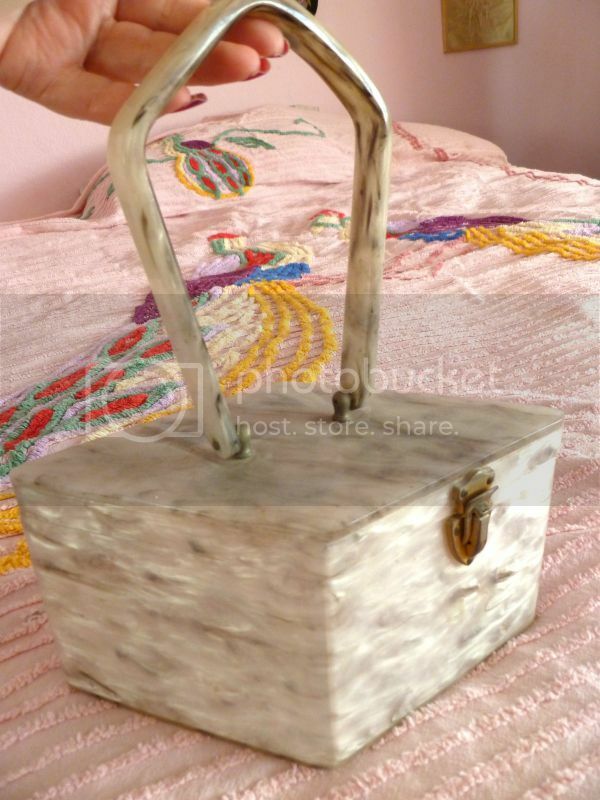 Fabulous and rare diamond-shaped grey marbleized Lucite bag with unusual handle. Of course I have a story about it! My husband found it many years ago, when I first started collecting purses, in a decrepit old store/warehouse/barn in Hemet, California. He paid $12 for it. 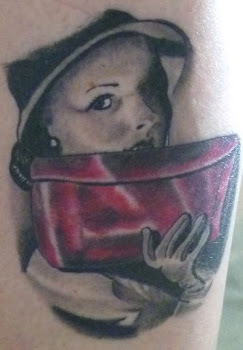 The first picture below is of the purse itself. 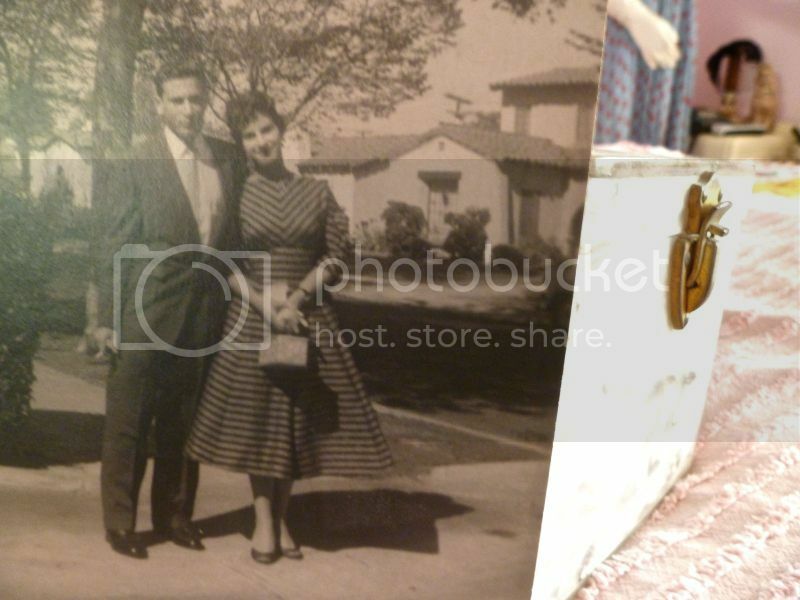 The second picture is my dad and his cousin some time in the mid-1950s. My dad was cute, wasn’t he? And his cousin's dress is gorgeous! 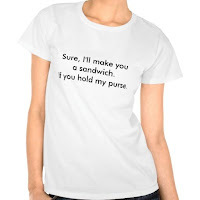 But… CHECK OUT THE PURSE SHE’S CARRYING! It’s similar to mine, and not just because it’s Lucite. It's kind of hard to make out, but look at the distinctive shape. I’ve posted these pics and other never-before seen photos on my new website, The Vintage Purse Gallery, a virtual purse museum featuring my vast purse-onal collection. I’m in the process of developing a traveling exhibit, so please let me know if you are affiliated with a museum or other venue that may wish to put some of these beauties on display. 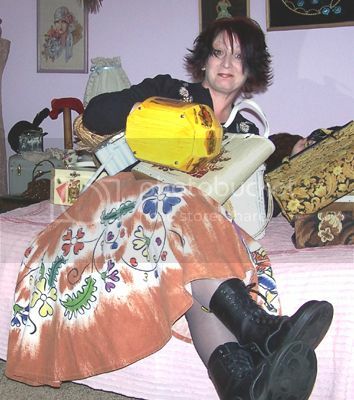 And don’t forget to like The Vintage Purse Gallery on Facebook! What a yummy bag! The shape is really unusual...and it does look amazingly similar to the one in the photo. Weird! Ha! I've never been there, but you reminded me of an anecdote. My husband and I were in yet another small, rural California town at an "antique store," which was actually a series of broken-down barns. I disappeared into the maze of rubble and he freaked out a little, worried that people akin to those in "The Hills Have Eyes" had nabbed me. As he searched frantically for some sort of farm implement with which to rescue me, I reappeared. Bonus: In a box of junk, I found a root beer Bakelite ring... for a dollar!